Sorrow can be seductive—but can hope triumph over heartbreak? A dark and searing novel from the author of When You Were Mine. Caggie never wanted to be a hero, but some things are decided for us. Growing up among Manhattan’s social elite, Caggie always had everything a girl could want, including a storied last name. But after saving a girl from the brink of suicide, Caggie becomes infamous, and now all she wants is to be left alone. After all, she’s still reeling from the death of her younger sister last January, the subsequent destruction of her relationship with high school boyfriend, Trevor, and the way in which her family has since fallen apart. So when mysterious Astor appears on the Upper East Side, he just might be the rescue she needs. But what is he hiding? As life as she knew it begins to unravel, Caggie realizes Astor’s past may be as dark as her own. And in a world in which she’s been branded a hero, Caggie will soon discover that no one can save you…not until you save yourself. 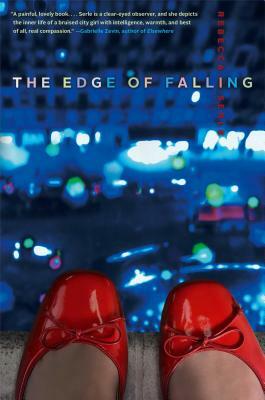 "The Edge of Falling is a painful, lovely book . . . Like her heroine, Serle is a clear-eyed observer, and she depicts the inner life of a bruised city girl with intelligence, warmth and, best of all, real compassion." "A beautiful and surprising story about loss, friendship, and, ultimately, learning to fly." If Pretty Little Liars and Gossip Girl had a baby, this book would be it!